A false wall is a kind of sacrificial pre-wall. It is GOOD because it allows us to reduce the thickness of the new bricks used when building and repairing the furnace. It is a general view of the work carried out by Sidenor in Refractory wastes management. It summarizes the situation Before and After the developed Project. It shows the great reduction in refractory wastes to be sent to landfill. This best practice is maintained and has been even improved nowadays. 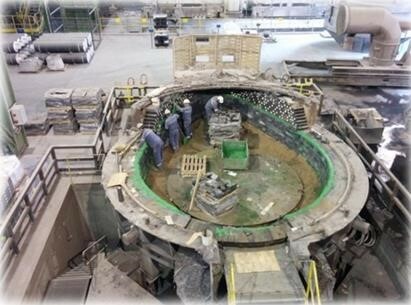 The aim of the developed project was focused on the integrated and systematic management of all the refractory waste products that are generated at Sidenor Basauri Plant. Before the project was set up, only a fraction of this waste was recycled (approximately 7%). The rest was sent to a landfill. The goal of the project was to recycle 50% of the residual waste generated (approximately 2,700 tons out of a yearly new consumption of 10,000 tons). This residual waste mainly consists of bricks from the demolition of Ladles, Furnaces and Tundishes. These wastes were classified into 3 groups: Magnesia-Carbon, High Alumina and Other Grades. The main part of the wastes (95%) is magnesite-based (associated with critical materials). One of the most surprising conclusions that came from the observation phase was “the under-researched and under-exploited market” for this type of wastes. A plan was drawn up consisting of 11 actions. These actions combined to mean that it was managed to recycle 94% of our waste, well above the target of 50% that was set at the start of the Project. The absence of any need for investment served to facilitate the development of this project. This project develops innovations that are totally new and unique. Reduction of 81.5% in the amount of waste dumped in landfills. Increase of 66.1% in the percentage of refractory material reused (directly or after recovery). Reduction of 7.9% in the use of critical materials and elimination of all impacts associated. Savings of €479,750 due to reductions in consumption of refractory material. Earnings of €36,018 from sales for recovery. Savings of €44,010 in the cost of dumping in a landfill (against a total of €54,000 without management). Immediate profitability because of the virtual absence of any need for investment. Promotion of the culture of reuse and recycling among staff at the Plants. Promotion of the values of teamwork. 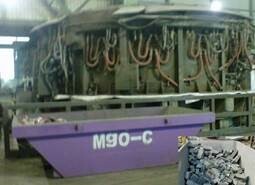 There is nothing to prevent the replication of this project in other Steelworks across Europe. The management of refractory material waste in the steelworks has no Best Available Techniques (BAT´s), most of it being dumped in landfills. To systematically manage the refractory waste generated (Recovery, Reuse, Remanufacture and Recycling on the operational routine). To get people aware (social acceptance) of the importance of refractory recycling. To find an effective application for the processed waste. To steer the project financially, choosing the optimum gain for the waste in substitution of new bricks or PRM (Primary Raw Materials) by recycled products. Reuse in case of sacrificial pre-walls (“false walls”**) in the Electric Furnace (costs 10x less). Remanufacture with the use of the recycled material for EAF breast* (less than 90 €/ton vs previous 132 €/ton and double the performance). See photos and better explanation below. All of the initiatives with strict attention paid at all times to legislation. These practices served to boost the Circular Economy of the magnesite and the extent of our Eco-efficiency. * The EAF breast is located in the door of the EAF; it is a zone that must be repaired every one-two heats and now we are using a recycled material instead of the previous commercial product. ** A false wall is a kind of sacrificial pre-wall. 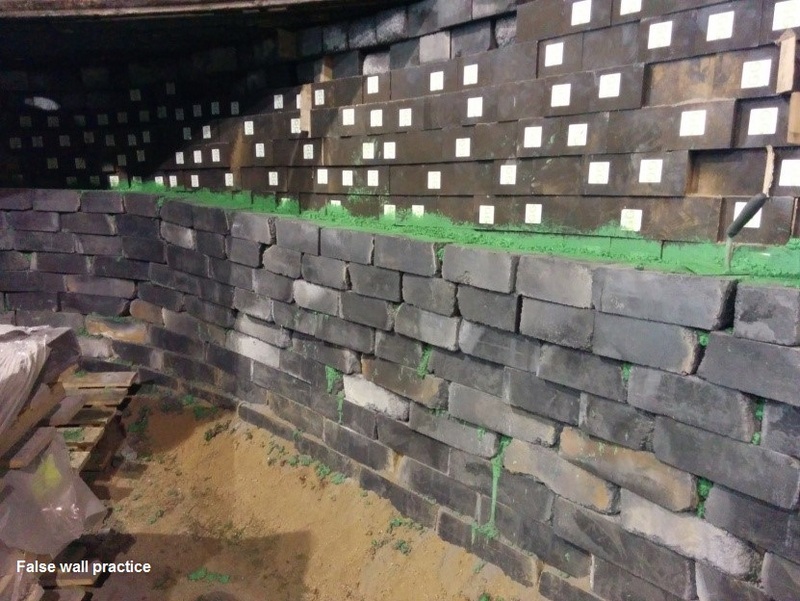 It is GOOD because it allows us to reduce the thickness of the new bricks used when building and repairing the furnace.